Bring the Boom with the SU-100Y "Box Tank"! Presenting "Box Tank: The Subtle Art of Boom"
It's tank destroyer week again, and the SU-100Y "Box Tank" is on special discount. This TD was built from a prototype heavy tank, so its size and lack of camouflage can be liabilities, though they're mitigated by a magnificent 130mm armament. 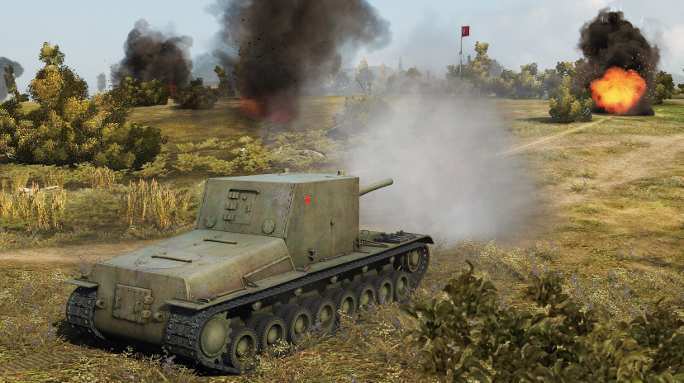 Does the SU-100Y fit your profile, or should you save up for something different? Find out below! Pick Up Your SU-100Y Today! Has a huge gun with good accuracy (.36), amazing penetration and great damage per shot, or "alpha damage"
If you enjoy "one-shotting" tanks of lower or equal tiers to you, this is the vehicle for you! In the SU-100Y it's all about the gun. Keep yourself intact, be mindful of your large size, and keep your gun talking! The standard loadout of Small First Aid Kit, Small Repair Kit and a Manual Fire Extinguisher is a good way to go, while Large Repair and First Aid Kits reduce the chance of damage or Crew injury from random artillery and HE Shells. Alternatively, a Binocular Telescope or Camouflage net can be swapped out with the vents for more view range or concealment. Boosting your Camouflage and Gunnery skills are crucial in this tank, as is Sixth Sense. The first Skill alerts you when you've been spotted, and tells you when to move. The Brothers in Arms Perk is also great as it improves major qualifications and all Skills for the entire Crew! The explosive SU-100Y is discounted in the Premium Shop for a limited time -- open up with the "Box Tank" today!